Welcome! 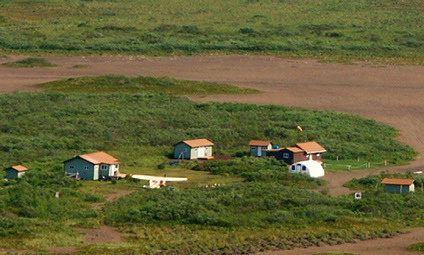 Pumice Creek Lodge is located on the Alaska Peninsula 376 air miles southwest of Anchorage and 86 miles from King Salmon, making us one of Alaska's most remote hunting and fishing lodges. We are a long ways away from the crowd but easy to get to, with turbo-prop aircraft by Alaska Airlines commuter service operated by PenAir. We hunt numerous clear-water streams which flow into the Bering Sea from the Aleutian Mountain Range. 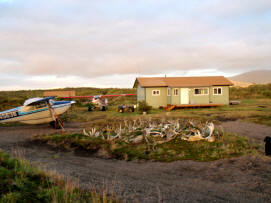 Pumice Creek Lodge is far from the crowded grounds of Bristol Bay and the Kenai Peninsula. Our comfortable facility is designed to accommodate up to six guests per week. Individuals, couples, and families are welcome at Pumice Creek. 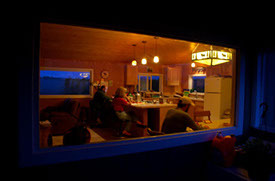 We offer two duplex style guest cabins and a six person bunkhouse. The sleeping areas have comfortable beds with cozy oil heat and a piping hot shower. Our lodge has wireless internet access. 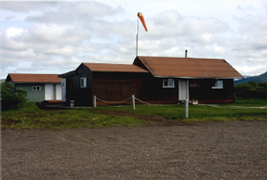 Pumice Creek Lodge is situated between two streams that have Kings and other salmon, Arctic char and with a short fly out, we can add several more species. 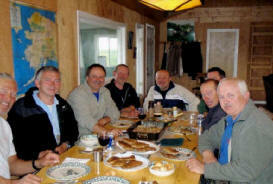 There are no other lodges in the area and the only other fishers walk on all fours.